An out-of-office message is an automated reply email sent to a person that sends you an email while you are out of the office or away from your computer. 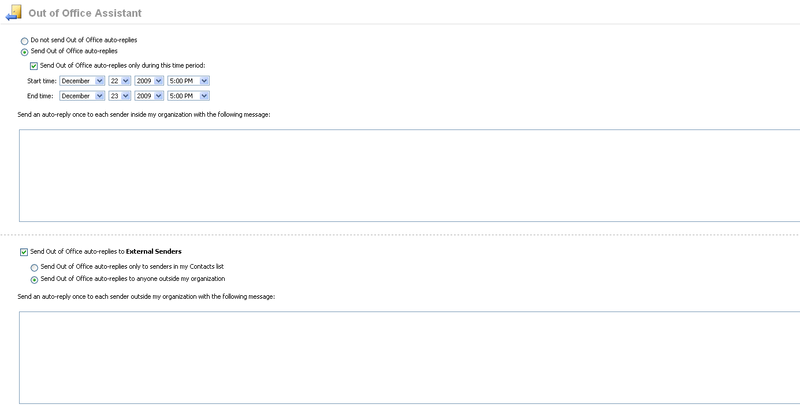 When using Microsoft Exchange, there are two different ways you can setup an out-of-office message. Once you have logged into Outlook Web Access, Click the Options menu item. 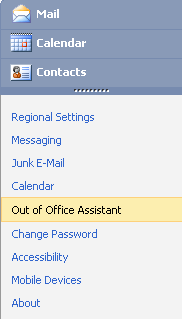 On the Out of Office Assistance page, choose Send Out of Office auto-replies. 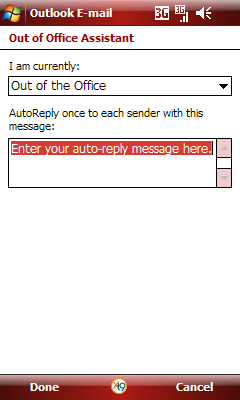 You can also optionally select the Send Out of Office auto-replies only during this time period if you wish to specify a time and date range for your auto-responses. Optionally specify the Start Time and End Time of which you will be away from the office. There are two seperate sections for specifying your out of office message. If you wish to send an out of office message response to people outside your organisation - then tick the Send Out of Office auto-replies to External Senders - then choose whether you want to send replies to everyone or just people on your contact list. Finally type in the out-of-office message reply that you wish to send to external senders in the box provided. After you have specified your out-of-office message settings make sure you click on the Save menu button in the top right corner. You can also use your windows mobile 6 device to setup your out of office messages. This is perfect if you have already left the office and are away from your computer. NOTE: In order for you to use a windows mobile 6 device to setup an out-of-office messages, your device must first be setup to work with Microsoft Exchange email. If this is not already the case please refer to Exchange Setup Guide for Windows Mobile 6 Devices. First open your Outlook E-mail application on your mobile device as shown. 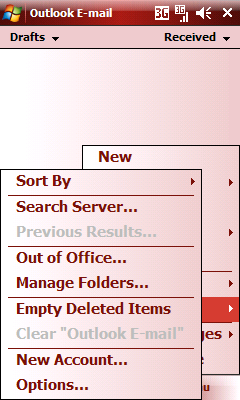 Choose Menu from the bottom right hand corner and select the Out of Office... option. Your mobile device may take a few moments to retrieve your out-of-office message settings. Change your current out-of-office status by selecting the Out of the Office option from the drop down list. Type your AutoReply message in the textbox provided. Click on Done in the bottom left hand corner. Your device will now save your out-of-office message settings to the server. When you return to the office, do not forget to change your status using the same procedure.